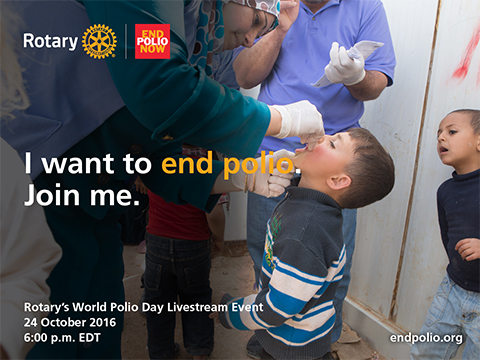 Rotary members in New Zealand will be among thousands worldwide reaching out during the week commencing on World Polio Day, 24th October 2016, to raise awareness, funds and support to end polio – a vaccine preventable disease that still threatens children in parts of the world today. Since Rotary and its partners launched the Global Polio Eradication Initiative (GPEI) nearly 30 years ago, the incidence of polio has plummeted by more than 99.9 percent, from about 350,000 cases a year to 26 confirmed as of 19th September 2016. They are in Pakistan 14, Afghanistan 9 and Nigeria 3. To sustain this progress, and protect all children from polio, experts say a further US $1.5 billion is urgently needed. Without full funding and political commitment, this paralysing disease could return to previously polio-free countries, putting children everywhere at risk. World Polio Day is celebrated each year. Initially it was established by Rotary to commemorate the birth of Jonas Salk who led the first team to develop a vaccine against poliomyelitis. Polio is a crippling and potentially fatal infectious disease with no cure, but can be prevented through immunisation. The vaccine, given multiple times, almost always protects a child for life. The strategy to eradicate polio is therefore based on preventing infection by immunising every child until transmission stops and the world is polio-free.